American singer, Katy Perry has now become the first person to reach 100 million followers on Twitter and it's a big accomplishment and also a good timing for the singer who is promoting her new album, "Witness." 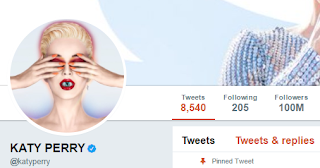 For Perry, Twitter has been one of her main forms of communication with her fans. She's sparked some major conversations on the social media platform, including one about her much discussed 2015 Super Bowl Halftime performance in which #LeftShark became a worldwide trending topic after one of her backup dancers, dressed as a shark, appeared to be out of step.